Back in the day (and by that I mean 2007-09), Granville Moore’s was a regular haunt of mine. A huge shared plate of twice fried fries (with lots of sauces) and a huge, steaming bowl of mussels (with lots of bread for dipping), with a couple Belgian beers to wash it all down, proved to be a solid way to start a Thursday evening. Well, fast forward 10 years or so, and Granville Moore’s is still delivering the goods. I haven’t been there much in recent years, so I finally decided to go as part of their short-lived 10-year anniversary special ($10 mussels). 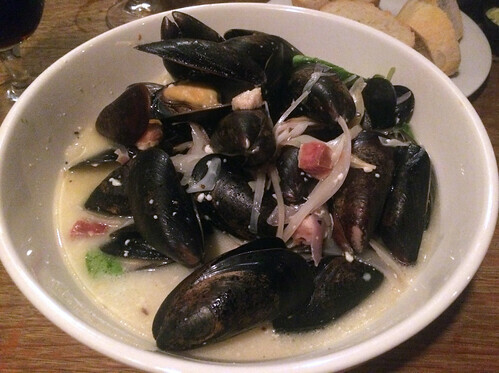 And since the Bleu mussels were always my favorite (all the styles are good), that’s what I ordered and that’s what I enjoyed. Because they are still quite good, with the pork bellies, healthy sized chunks of Hook’s blue cheese, and a white wine and lemon broth. If you’ve never been to Granville Moore’s, go and try this: plate of fries and 1-2 different styles of mussels to share. Ask for more bread, you will need it all. If you order just for yourself, get the Bleu. If you haven’t been in a while, don’t hesitate to head back!